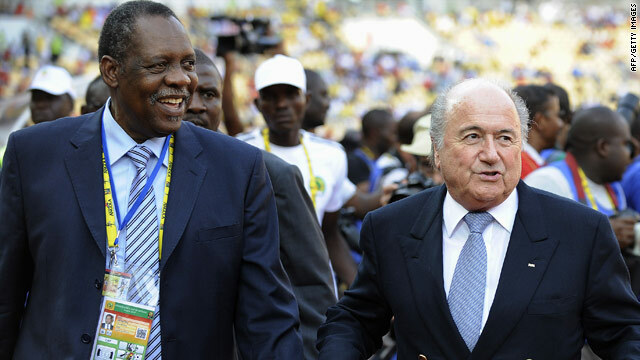 CAF president Issa Hayatou, left, and FIFA chief Sepp Blatter arrive for the African Nations Cup final in Angola on January 31. (CNN) -- Togo may be allowed to take part in the next African Nations Cup after world soccer's governing body FIFA stepped in to mediate the row arising from the team's withdrawal from this year's event. The Togo Football Federation was fined $50,000 and excluded from the 2012 and 2014 tournaments after pulling out ahead ahead of the start of the Angola edition in January due to a deadly gun attack on the team's bus. National captain Emmanuel Adebayor decided to quit international football due to the trauma of the incident, which saw rebels fire on his players and kill three people. Togo appealed the Confederation of Africa Football's decision to the Sport of Arbitration for Court, with FIFA president Sepp Blatter subsequently brought in to mediate the hearing. As a result, the president of the CAF, Issa Hayatou of Cameroon, will ask the African ruling body's executive committee to lift the ban at its next meeting on May 15. As part of the deal, the TFF admitted that it had not complied with CAF competition regulations when it withdrew the team, known as the Sparrow Hawks. "I am very pleased that we have been able to find a solution which is satisfactory for both parties," Blatter said in a statement on Friday. "Today marks a victory for the whole football family, particularly for African football. This shows that we can solve internal disputes within the football family for the benefit of all those who are involved in our game, and in particular for the players." The CAS, an independent tribunal that deals with sports disputes, was also relieved that it had been able to broker a deal. "Considering the emotional circumstances surrounding this case, it was very important for the parties to find a reasonable solution in order to put an end to their dispute," Secretary General Matthieu Reeb said.